Received July 3rd, 2009; revised August 11th, 2009; accepted August 20th, 2009. The FMCW radar has to adjust the range of frequencies of operation to suit the material and targets under investigation. The transceiver generates a signal of linearly increasing frequency for the frequency-sweep period. The signal propagates from the antenna to a static target and back. 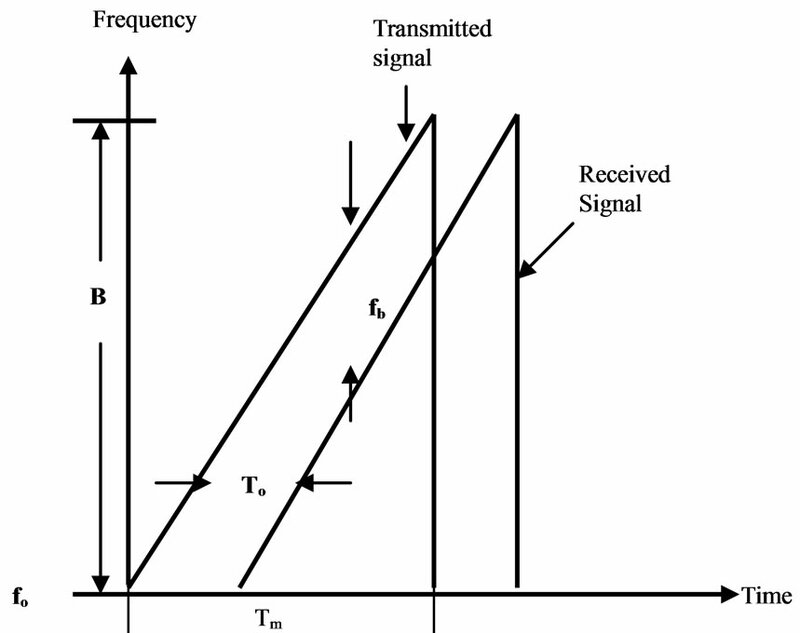 The value of the received-signal frequency compared to the transmitted-signal frequency is proportional to the propagation range. The main advantages of the FMCW radar are the wider dynamic range, lower noise figure and higher mean powers that can be radiated. In addition a much wider class of antenna is available for use by the designer. The further advantage of FMCW radar is its ability to adjust the range of frequencies of operation to suit the material and targets under investigation if the antenna has an adequate pass-band of frequencies. This radar system mixes the wave reflected by a target object and part of the radiated wave to obtain a beat signal that contains distance and speed components. For large scatterer, the physical-optics approximation is an efficient method in the frequency domain [1,2]. This physical optics (PO) approximation is initially applied in the frequency-domain with the inverse Fourier transform , , , . 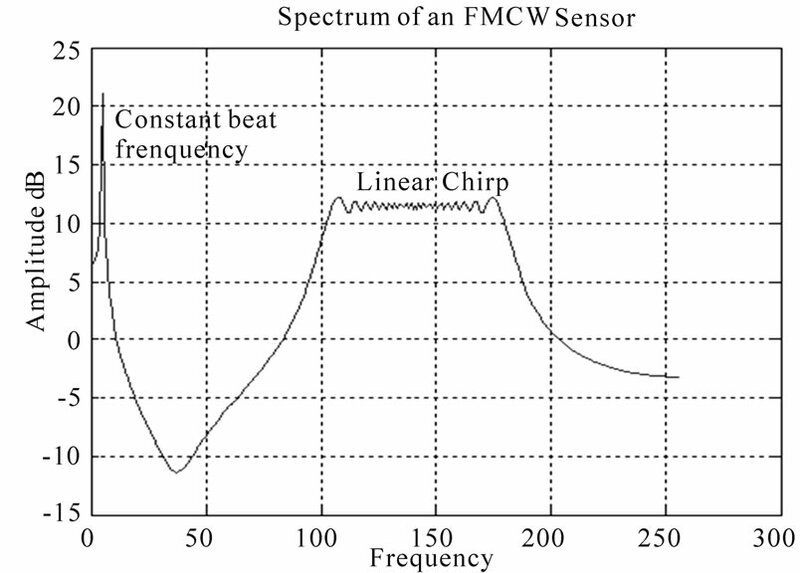 With FMCW, the high-frequency circuitry for beat signal detection is relatively simple and distance can be directly obtained. By mixing the received FMCW and transmitted FMCW signals, the system obtains a beat signal having a frequency f b. The principle of the FMCW radar is shown in Figure 1. Transmitted signal from one of the antennas is reflected, and is received by the other antenna with delay time To relative to the original transmitted signal. Mixing the received and transmitted frequencies, the beat frequencies are observed in the spectra. From the geometry of transmit and receive waveforms we can derive a relationship between the beat frequency f b, the range R, and c is the velocity of light. where is the unit vector normal to the surface and is the incident magnetic field with angular frequency w.
where the vector locates the integration point on the scatterer surface, is the wave number, is the velocity of the light and is the intrinsic free space impedance, and is the surface-current distribution. where is the input waveform in frequency domain physical optics, this is just a magnitude of the source. where is the Complex antenna factor. when h(t) is a sample delay of To, i.e. The first Cos term describes a linearly increasing FM signal (chirp) at about twice the carrier frequency with a phase shift that is proportional to the delay time To. This term is generally filtered out. describes a beat signal at a fixed frequency . As h(t) given in section 3.2 is just an idealized model, more realistic h(t) obtained by PO in section 3.1, Equation (12) shall be used. It is sufficient that is computed only within the source frequency range, i.e. Outside the band, can be assumed zero, is also zero in this region. where is a sampling frequency, , and are some certain integers. It can be seen that the signal frequency is directly proportional to the time delay time , and hence is directly proportional to the round trip time to the target. This paper presents the time domain linear system analysis for FMCW radar response by performing the inverse Fourier transform over the frequency-domain scattered field which obtained by calculating the integral over the illuminated surface using the free space Green’s function. Then we got the received FMCW signal and transmitted FMCW signal, the product detection is implemented to get the beat signal. The Fourier transform is used to find the beat frequency. C. A. Valagiannopoulos, “Electromagnetic scattering from two eccentric Metamaterial cylinders with frequency-dependent permittivities differing slightly each other,” Progress In Electromagnetics Research B, Vol. 3, pp. 23–34, 2008.